Finding the best push toy for toddlers can be difficult, that’s why we are here to help you find the best choice for your little ones. As all parents with toddlers will know, the toys we buy for these little ones are not just about fun and games. The best toddlers toys are designed to help with with the fast development, both physical, mental and social, that is occurring at this time. Push and pull toys will make a great addition to your toy collection as they help our precious children in developing key motor skills and mobility, as well as having a great amount of fun at the same time. By investing in a good push along toy for your toddler, you will be giving them a great gift that they will just adore plying with, and but also giving them a great tool to help with some of the fundamental movements they are trying to get to grips with, such as balancing and walking. Assisting with walking and pulling themselves up The main benefit of getting your toddler a push toy is that they help with their motor skills. Even as young as 1 years old, a it will help your little one pull themselves off the floor into a standing position, and you might not realize it, but this is a really valuable skill they have to learn. Then, when they start walking, the push along toy really comes into its own. The push walker will support them and help them balance while they walk as well as teaching them to look ahead. It’s not a magical ‘learn to walk’ tool, and your toddler will need lots of encouragement and a cuddles to get through those inevitable falls, but a walking toy is a great assistance to this process. Children learn by imitating As you know, the main way toddlers learn is by copying adults and older children, so any toy version of something you have is going to be irresistible to them. Therefore, by giving your toddler a push toy that is related to something you use, such as a shopping cart or a wheelbarrow, they will love playing with it as they can feel like they are doing the same thing as their parents. They stimulate fun and creative play Push toys can be really marvelous ways to play lots of cool different games with your children. If you get one with space they can store things in, you can teach your child to fill them up with, for example, wooden blocks, and the take them to other parts of the house. With my own little one, for example, we used to play a game where I’d put his shape blocks at one end of the room, and shape holder at he other side. He’d then have to put his blocks in his push car, take them to the shape holder and then fit them into the right shaped-hole. Children can feel like they take part in household activities Even at a every young age, it is a good idea to start planting the ideas of responsibility and helping out around the house in your children. Push toys are a great way for them to have fun but also appreciate the need to help with the housework. If you have a toy vacuum cleaner, for example, your toddler can follow mum or dad around as they vacuum and feel like they are helping. Learning Walkers Designed to help you child learn to stand upright and then take their first steps, learning walkers will make a wonderful gift for your toddler. 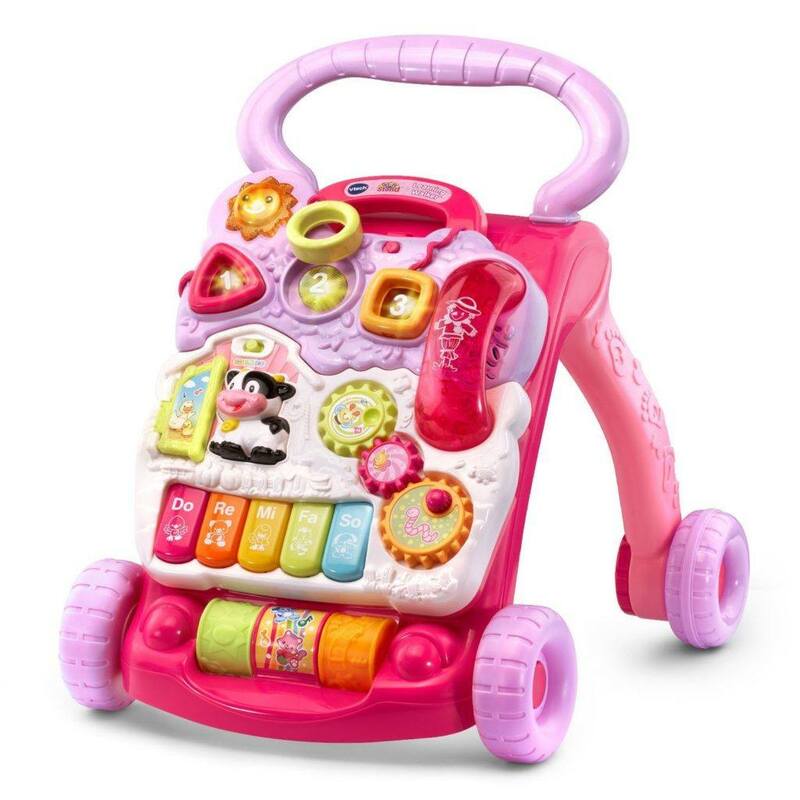 Many of them, such as the Vtech activity walkers, also come with lots of different toys and games attached, such as toy telephones or number and word games, so you are not only buy a push toy, but a whole interactive play station perfect for a 1 year old. Wagons A real children classic, these radio flyer style wagons make great gifts for toddlers and even young children as they can not only use them to help with balance and walking, but the wagons can be used for your child to transport their other toys around and play all sorts of fun filling up and loading out games. A lot of kids also love jumping into their wagons and riding around in them. This can be amazing fun, but make sure to supervise them carefully if they do this. Shopping Carts Another firm favorite push and pull toy, little shopping carts will be great fun for your child as they imitate how mummy or daddy does the grocery shopping. 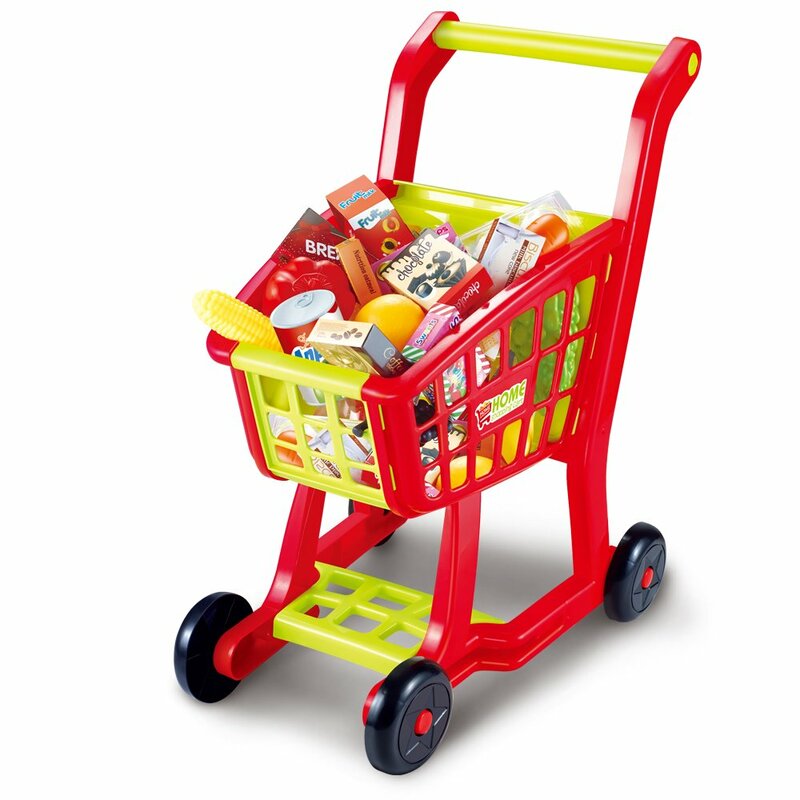 These carts often come with lots of accessories, such as play food and shopping, which your child can use to play a whole host of fun games. Also, they can double up as nice little storage containers for all of their other toys. Animal walkers These cut little push a long walkers don’t offer as much support as some of the other ones, and we really recommend them for older toddlers of around 3 years old. However, as their a bit smaller and more maneuverable, older kids will be able to go faster with them, and they will really love the more freedom these animal push and pull alongs give them. These are great for animal lovers and households with pets. Toddler Push Cars There are some really great push toy cars available too. Some of these are even big enough for your child to sit in them, so you have the bonus of being able to push your child in it when they are smaller, and then your child can push it themselves when they are big enough. So you get very good value for money with one of these. Push Along Prams WE all know how much little girls love playing at being mum, and push along doll prams are a great toy for your little princess to play with. They not only have all the benefits of a push walker, such as helping with mobility, but they also give your daughter endless amounts of fun as she plays with her toy dolls. Parent’s can generally get a bit confused when buy a push toy as some are advertised as push, some push and pull, and some pull. Some toys are specifically designed to be both pushed and pulled, while some have strings attached and are mainly to be pulled by your child. While no one type is better than the other, we do wish to warn you that pull toys are really only for children who can already walk, and they require quite a bit of supervision and you child will be dragging them form behind, or maybe even walking backwards with them, so you’ll really need to keep an eye on them to stop them hurting themselves if they have a pull toy. Materials Most toddler walkers are made of plastic or wood, so only buy toys that are made of high-quality child safe plastic or wood, and be sure to check that the paint or wood finish the manufacturer has used is non-toxic. Never buy anything with lead-based paints; these are very bad for children’s health. Another thing to watch out for with wooden push walkers is splinters; there’s no point buying any toy that is going to end up hurting your child. You might be able to sand down any rough wooden parts in danger of splintering, but why go to all that effort when you can simply by a better wooden walking toy in the first place. Durability As your dear one will be using this toy in order to help them get the hang of walking, you want to buy something that is sturdy and robust. The last thing you want it your child losing their confidence in their developing ability to walk because their toddler walker gave out while they were using it. You may also be looking one that can be used outside and inside. If that is the case, look for something that is water proof just in case, especially if it has electronic parts. Batteries required Many of our favorite picks for toddler walking toys are electronic, and they play songs, make sounds and have flashing lights. Your toddler will absolutely love these kinds of features, but only as long as they are working. Therefore, if you buy an electronic push toy, check what kinds of batteries it take and also if batteries are included. It is also a good idea to think about investing in rechargeable batteries and a batter charger, as running back and forth to the store to keep buying more batteries can end up being time consuming and costly. 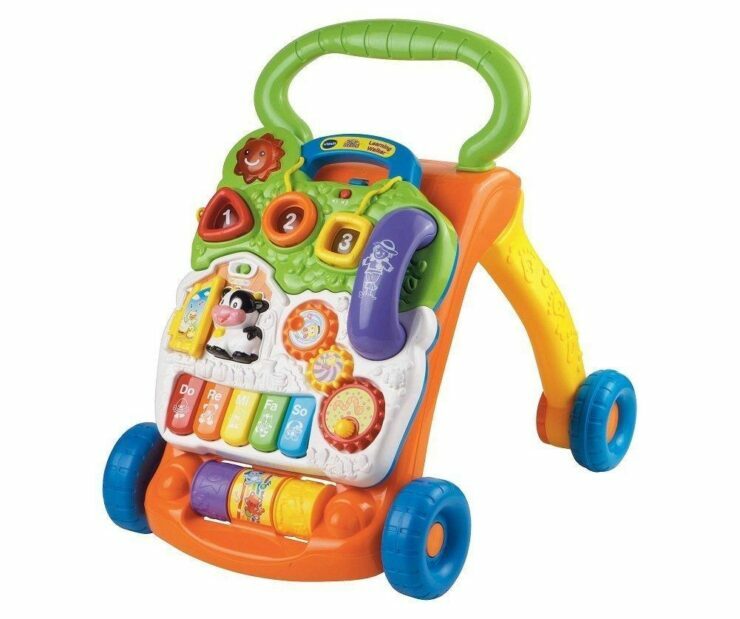 Vtech These activity walkers are very popular with younger toddlers, as they help them to learn how to pull themselves up off the ground and assist with taking those first steps. Moreover, they come with all sorts of toy sets attached to them, meaning your child can get much more enjoyment out of them than a normal toddler walker. Fisher Price Fisher Price are one of our favorite toy manufacturers, and with almost 90 years of experience since they started making toys, you can be confident in both the innovative design and quality of materials that they use. 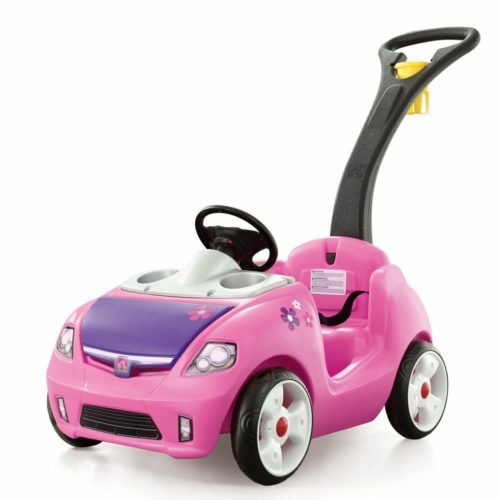 We are also very impressed at the huge variety they have in their push toys, from lawnmowers to cars to mobile kitchens, and they make lots of nice designs for girls and boys. Little Tikes Another well respected and trusted American toy maker, Little Tikes make simple but very sturdy and reliable walking toys for toddlers. They don’t have flashing lights or playful sound effects like other manufacturer’s models, but this is not because tey are lazy. Little Tikes design philosophy is that simpler toys make your little ones use their own imagination and more made up games. Whether that’s true or not, we can’t argue with the fact that Little Tikes toy shopping cart walkers have been selling like crazy. Melissa and Doug Having grown from a little 2 person company making toys in their parents basements to one of the top toy manufacturers world wide, its not just Melissa and Doug’s success story that is impressive. They make some amazing wooden walking toys with some cool retro designs, and their chomp and clack alligator walker is a prime example. Bright Starts This is another manufacturer who is well known for making some excellent toddler walkers. The Bright Starts series, like their name sake, are very colorful and cute, and have been very popular with young toddlers and their parents. Many of their walkers also have flashing lights and sounds, and they also have a range of really cool Ford push car that automobile lovers might want to get for their children. Debenhams is where there are loads of items worth considering, many type of deals and coupons. Debenhams Offers from dealslands. Now, let us start this off by saying that of course your baby is not going to be walking with their push and pull toys. However, there are quite a lot of little walkers made for children under 12 months old, and although they are not meant to be used standing up, they do introduce your child to the mechanics of pushing and pulling, and will make their transition to using a walker a little bit easier. They’re also really fun for babies too. As we said before, no one is expecting your baby to walk around with its toys, But this cool car will introduce them to the ideas of pushing and pulling toys, and will make that activity walker you buy him or her when they are a little bit older a lot easier for it to use. 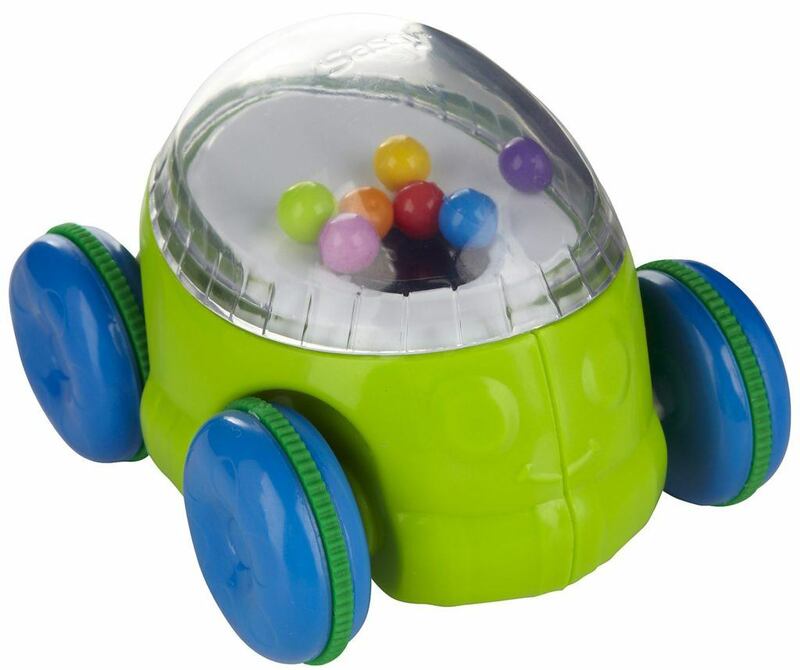 This particular car is also a lot of fun for your babies to use as they can pull it back and the car will shoot forward, all the while the beads bouncing around in the dome. Learning is made fun and easy in the toy push truck. 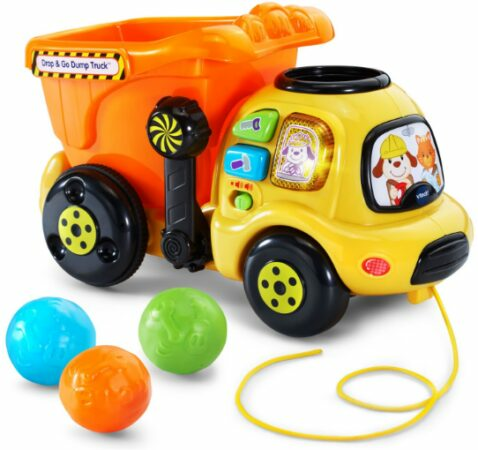 Your 6 month old child will have a real blast pushing this cute dumper truck and around, filling it up with toys and then dumping them in other parts of the room. 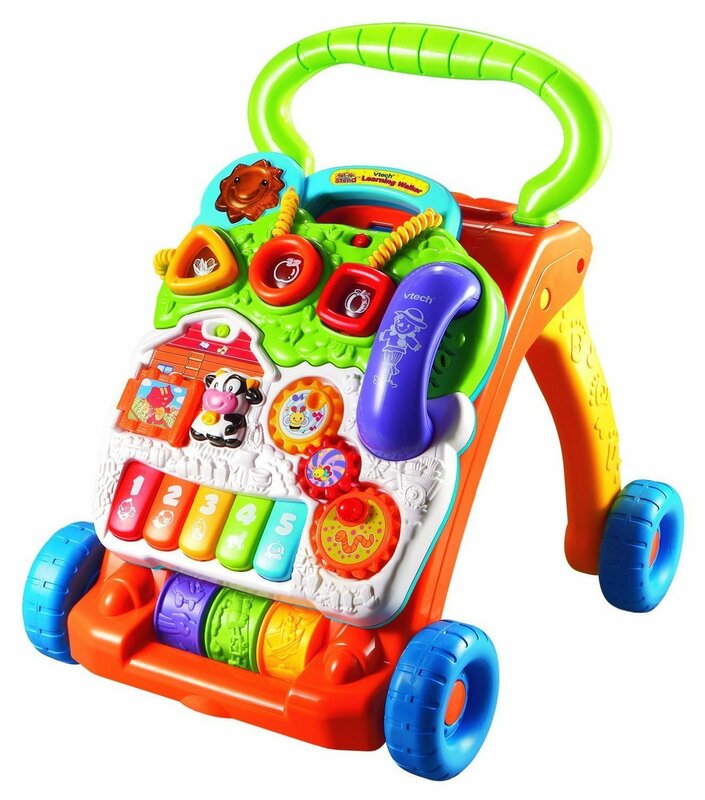 This baby push car also has three different buttons, which play songs and melodies. Your child will love playing delivery games with this cool truck. This brightly-colored and super cute little turtle will make an excellent first push along toy for a precious little baby. 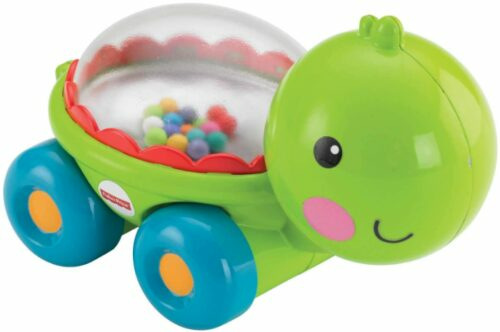 Your little one will adore pushing this around, is its colorful balls bounce in the dome and it makes great popping sounds, and all the while this will help them learn to crawl and develop motor skills. Also, it has soft edges and very child safe design, so you don’t have to worry about them hurting themselves with this. 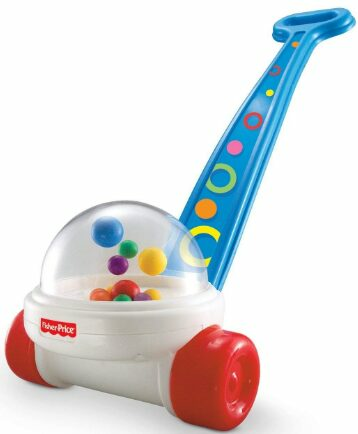 Developed by Fisher Price, you can be sure that this is made to a very high qualify and doesn’t contain anything toxic. 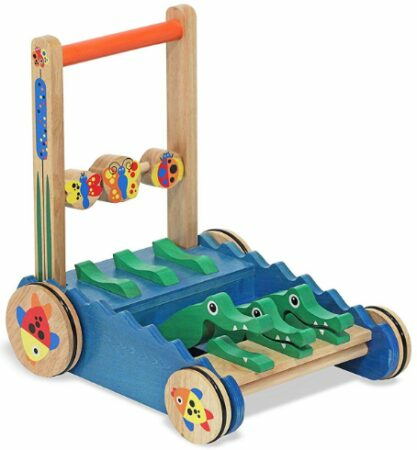 Made by those toy extraordinaires at Melissa and Doug, this cute wooden walking toy makes learning to walk a joy. This sturdy and dependable walker is handcrafted to perfection and makes a brilliant toy to help your dear one take their first steps. This awesome push along toy encourages exploration and discovery, as with each step the alligators mouths snap shut, making cool clomping sounds. This great toy has been designed to instill a sense of wonder an excitement in your children without flashing lights or electric sounds, so if you are looking for a great retro or wooden walker for your child, this might be something to look at. Sometimes its the simplest toys that really spark of your kid’s imagination. 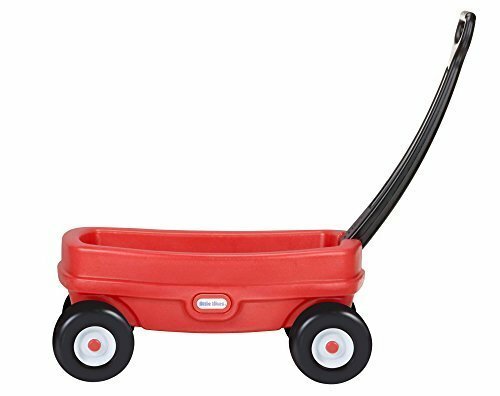 This neat little red wagon is about as basic as it gets. However, don’t let that turn you off. Your little boy can not only use this to help get a grip on the tricky business of walking, but it’ll be a great addition to his other playthings as he stuffs it full off his favorite toys and takes them off on adventures. While this may be very light on features, it is built to a very high standard, with durability and stability that will satisfy even the most suspicious of parents. It is also good for both indoors and outdoors; just remember to clean those wheels before letting it in the house again. Also please not that the manufacturer does not recommend letting the child ride in the cart. A classic toy that has been entertaining toddlers for generations, this particular model has been designed to be very sturdy in order to give maximum support to your tot. It also encourages them to keep on walking and exploring as the balls in the dome jump up and down like popcorn and it makes a satisfying snapping noise that your child will really love. While this doesn’t have the fancy features and technical specifications of some of the other walking toys, there’s no denying just how much fun kids have with these, as the Corn Popper has been one of Fisher Price’s biggest sellers for decades! This cute little zebra is a wonderful walking toy and play set all wrapped up into one colorful package. Toddlers taking those first awkward steps can do so with a firm and sturdy activity walker (and obviously a little help from mum and dad) and also work on their ABCs at the same time. This zebra will make a great new buddy for your toddler. Whether they use it upright or sitting down, it has a whole bunch of hands-on activities to stimulate learning, with dials to turn, songs that play, and even a peek a boo game. At StarWalkKids, we love retro toys, and this cool toddler walker definitely has a classic 20th Century design and style that really makes it stand out. The butterflies on the walker flutter about as your child pushes and pulls it. It makes a great toy to encourage walking and improve balance, and it is good for both indoor and outdoor play, your kids will keep active and burn off a lot of energy with it. 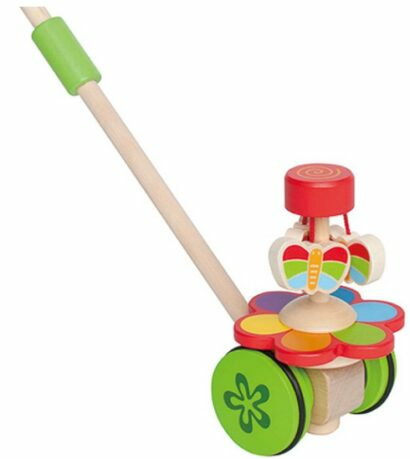 This walking toy is also made to very high safety standards, with durable child safe paint and solid wooden construction, and the wood used comes from an environmentally sustainable forest. This toy also won the 2011 Oppenheim Platinum Toy award. 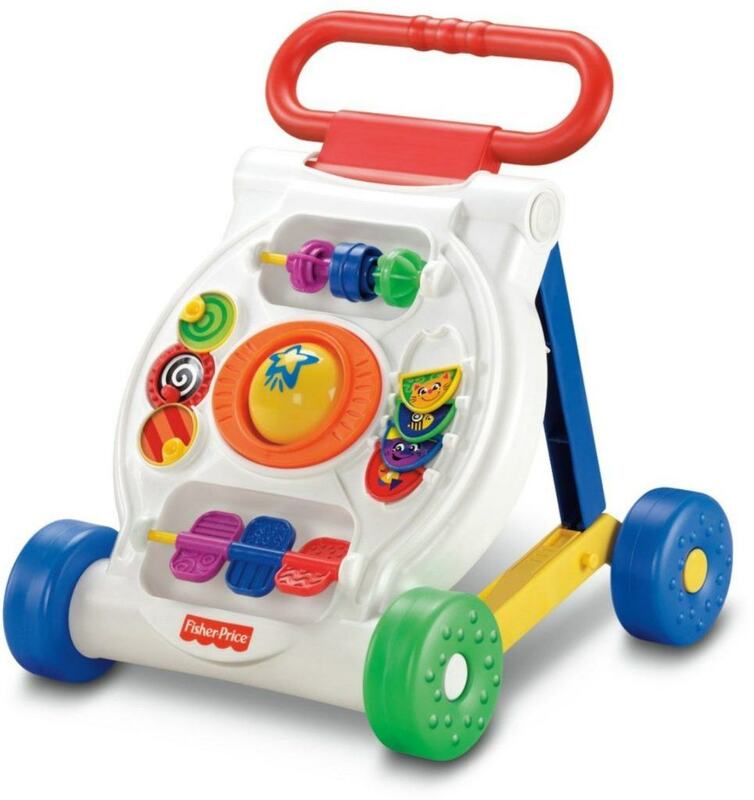 This little walker brings a whole load of fun with wherever your child take it. 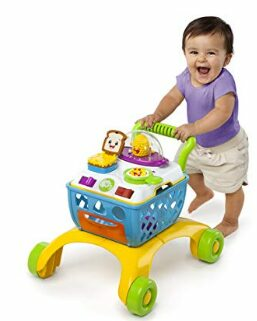 This toddler walker has all kids of great features for them to push, pull and flip, which will help them improve motor skills and inspire their curiosity and sense of discovery, and having a great time while they do it. What really impressed us the most about this one is that it can fold down into a cool, flat toy car. This is brilliant as your child can not only play with it as a walker or a car, but folding it down make it much easier to store. It also means that younger children who aren’t big enough to stand yet can play with it. We all know that toddlers just love copying their parents, so why not give them a cool toy vacuum to play with while mum and dad cleans up the house? 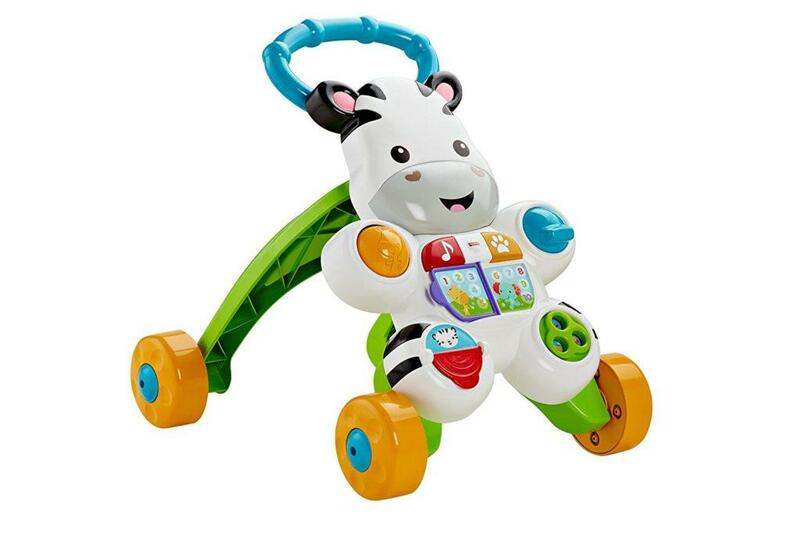 Learning to walk will be a breeze with this toy as it glides effortlessly over the floor, giving your child support and help with there balance as they get more comfortable with walking up right. While this helps with mobility and motor skills, it is also a great tool to help with learning numbers, and it comes with little blocks that will made fun noises when the vacuum gobbles them up. Just to note, although this Vacuum cleaner toy is designed for girls, here at StarWalkKids we really appreciate little boys who want to roll up their sleeves and help with the house work too, so there’s no reason why you couldn’t buy this for a son, grandson or nephew as well. This colorful activity walker is just packed with different features and accessories to keep your little chef occupied for hours at a time. The detachable cook top lets them play at cooking, and makes wonderful cooking sounds as they pretend to make pop corn or fry eggs. The cart legs can also lock in order to make it like a mini kitchen for your girl to play in. You can also pop the cooker off in order to transform it into a nice little shopping cart, only giving more scope for fun and games. Made by those ingenious folks at Bright Starts, the wide and sturdy legs provide great support to toddlers learning to walk, and they’ll be absolute in love with all the cooking features. Now this is going to be the kind of push today that has years and years of playtime ahead of it. 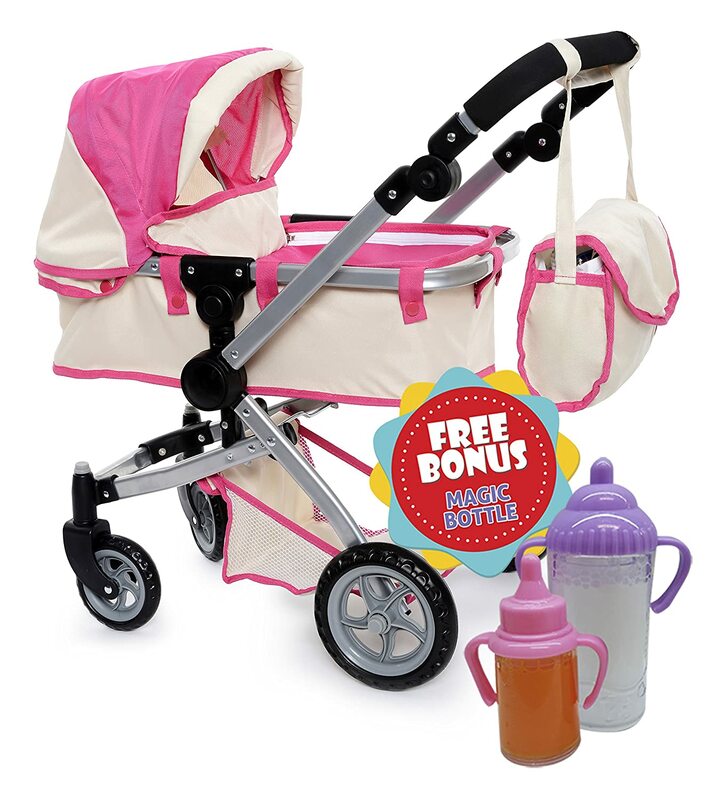 This three in one push can be used as a stroller when you child is younger, but then once they are old enough to start walking, it doubles up as a walking toy or ride around in it. Talk about getting your money’s worth with this one! 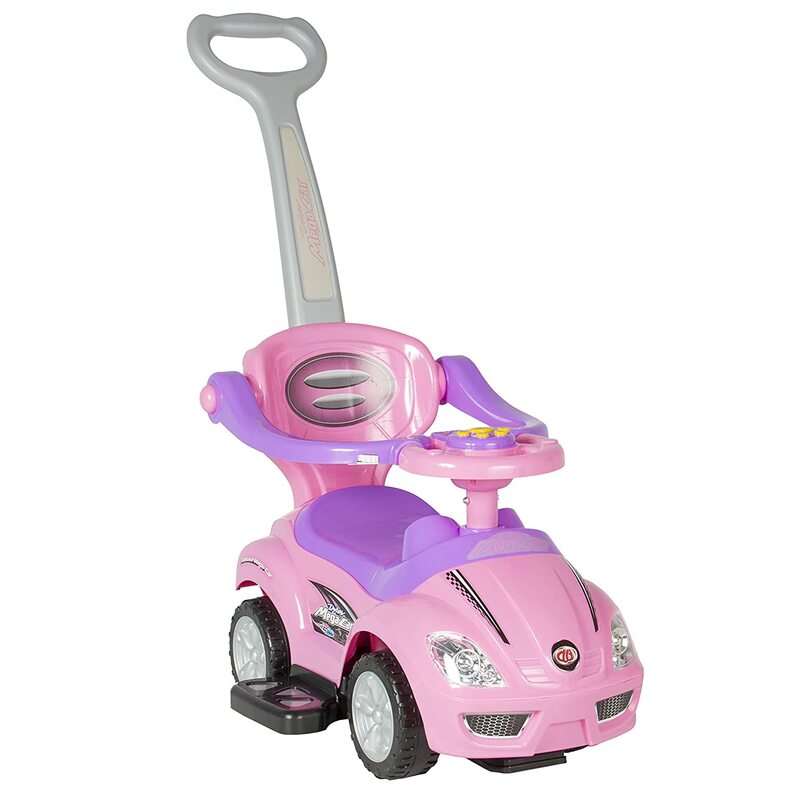 Little girls will love its adorable pink color scheme, and whether they push this around with their favorite toy in the chair or race around in it themselves, you’ll be very happy with this multifaceted toddler push car. 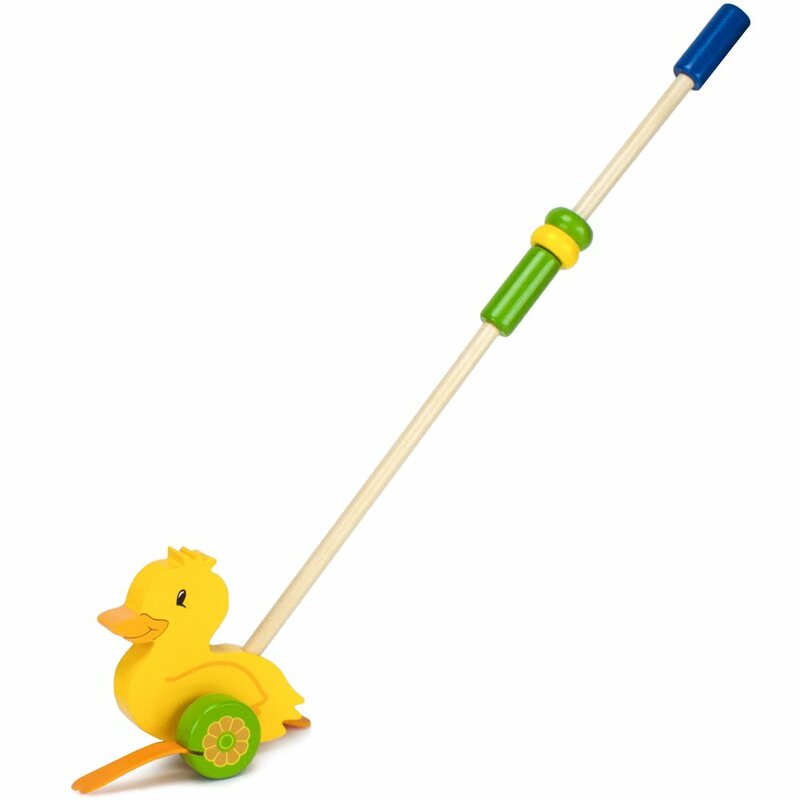 This neat little push along toy is a great gift for toddlers as it not only helps them learn to walk, but it also teaches them that housework and garden chores can also be a lot of fun. 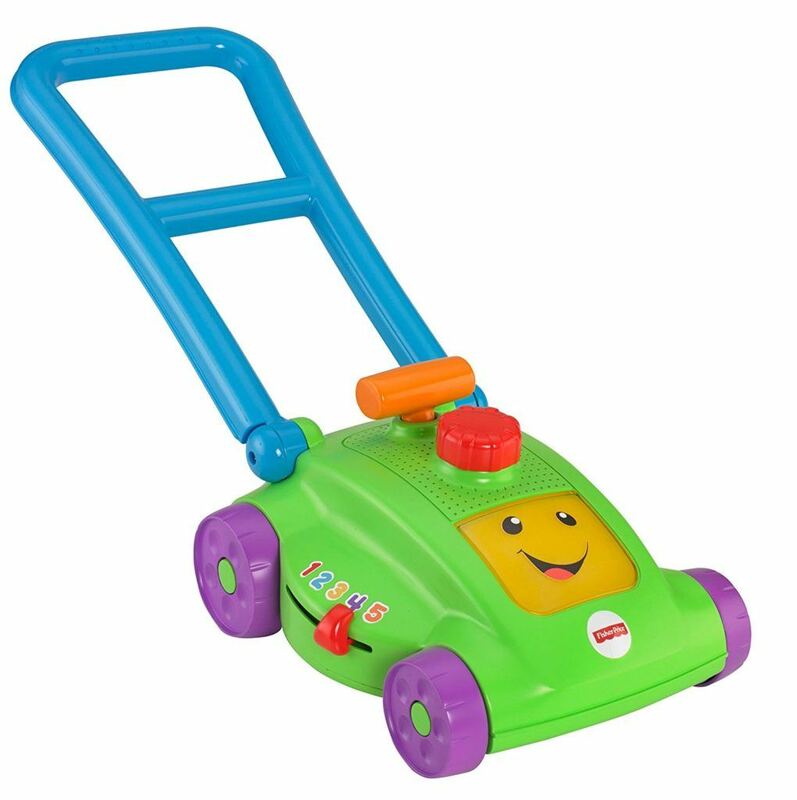 This colorful and cute lawnmower is sure to be a firm favorite with your kids, and will set them on the path to have some serious green fingers. What impressed us the most about this one, though is how its Smart Stages features can be adjusted to suit your children’s age. It comes with three levels, from 12 months to 24 months, and each stage has its own songs to match that age’s development. So it not only helps with motor skills and spatial awareness, but also with words and phrases. Brilliant! The perfect ride for a stylish little lady, this cool push car is the kind of thing that keeps on giving over the years. 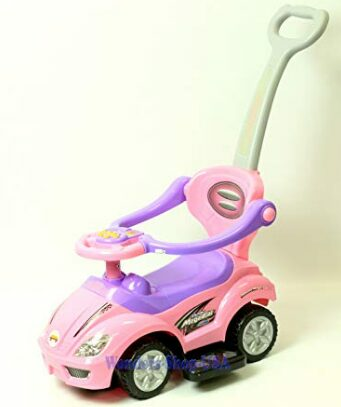 Many parents will use it as a push can when their girl is very young (it even has a cup holder on the handle so parents can take some water with them when they go out), and your princess will just love riding around in this cute pink machine, beeping the horn all the while. Then, once your child is learning to walk, they can use it as toddler walker, and drive around their own dolls or toys in the seat they used to sit in. It also has a cool little storage space under the hood, which is great for playing games with or hiding their treasurers in. Sometimes the numbers just don’t lie! The Vtech Activity Walker is the number one best selling push and pull toy on Amazon for a reason. On the one hand. this is a sturdy and dependable toddler walker that will give them a great start as they get to grips with those tricky issues of balancing and learning to walk. On the other, your toddler has a mobile activity center to take with them, with colorful games and buttons that also help them with their motor skills and sound recognition. You can also detach the activity board, so your child can play with it on the floor if they want to. We recommend this colorful push toy for your toddler as has so many different functions and will keep them busy for hours at a time. It also comes in green, lavender, or pink, meaning that this can be a great gift for a boy or girl. We all know how much little boys love to make noise, so we’d recommend the Chomp and Clack for sons, nephews and grandsons. Your little lad will have a brilliant time running around with this wooden, retro style push and pull toy, and he’ll feel like a little Indiana Jones exploring the jungle as the wooden alligators snap and chomp as he goes. As we’ve said before, kids love to imitate their parents, so we think the Shop N Cook will make a fine gift for your daughter. She’ll not only have a great time taking her mobile kitchen with her all over the house, she’ll be making real strides in her efforts to master walking and balancing as she does. Also, if she ever gets bored of the cooking games (and we doubt she will for a long time) she can transform the toddler walker into a shopping cart and play even more games with it. Overall, your one year old girls will love this set, and we recommend it because its many different functions will definitely bring years of enjoyment. It might not have flashing lights, sound effects and music, but the Fisher Price Corn Popper has been one of the companies best selling toys for many years now, and 1 and 2 year old toddlers adore playing with them. We recommend this as our budget pick as it makes up for its lack of features with its sturdy and reliable build and materials.